I am so blessed to be an aunt to 4 little girls; aged 3-11, and a godmother to 2 little girls; aged 5 & 9. Between trying to inspire working women with this little corner of the internet here on LegalLee Blonde, and spending time with my little nuggets; I spend a lot of time thinking about how I can encourage and inspire. “Rule Your Room” Invention Kit – Pre-teen girls are suddenly so focused on ‘their’ space. Chanel this energy into something good for them with this kit that allows them to protect their room from siblings or just make it feel like their own private space while learning about electronics to create different inventions. World Map Color Your Own Pillowcase – This pillowcase has a map outline which a young girl can color and decorate. The map also has facts and trivia about different countries, so there is tons to learn as they color. My Girl Power Journal –This journal uses DC comic female superheroes as the catalyst to encourage girls to write, draw & create. There are prompts such as “what makes me feel strong” and “who would I choose as my sidekick”. Kano Wand Coding Kit – With this kid, your kiddo builds their own wand while learning about basic coding so that they can use their wand to make ‘magic’ by floating feathers, etc on the screen. Goodnight Stories for Rebel Girls – I bought this book for my niece last year and it was incredible to see her read the stories and engage with the content. I highly recommend this book for anyone wanting to encourage a young girl to stand up for who she is and believe in herself. People have loved this book so much that there is now also a Goodnight Stories for Rebel Girls Volume 2. The Big Book of Girl Power – A great gift for girls who like comics. This book uses DC’s female super heroes and shows girls their strongest qualities. Girl CEO – This book shares mini-biographies of leading women – and girl – entrepreneurs. Oprah, Tavi Gevinson, Sheryl Sandberg and more. Each biography provides different lessons in life and leadership. The perfect gift for a budding entrepreneur. The Big Book of Girl Stuff – An amazing book for preteen girls. Think of it as a more modern day Judy Blume (… I’m not the only one who remembers Judy Blume right!?!) This book tackles issues of importance for preteens and is a great way to open up a dialogue with young girls about the issues discussed, including body image, self-confidence and crushes. “Girls Can” Crew Neck Tee – Love the message, love the foil print, and love the under $10 price tag! “You Got This Girl” Football Tee – The perfect long sleeve tee with a great reminder. “Girl Power” Terry Dress – A great cozy dress for young girls to wear with leggings this winter. I love that all three of these items of clothing have a positive message. They’re great as gifts to inspire young girls. Fort Magic: Fort Building & Construction Kit –This kit is SO cool! With it you can design and build a number of different shaped forts. It teaches young girls about building & construction in the most fun way. Women of NASA LEGO Kit – For girls that love LEGO there are a number of really interesting kits that encourage their love of LEGO while enforcing the reminder that girls can do anything. This women of NASA kit is a great choice. Big Bag of Science – This kit makes science so fun with real scientific tools – with instructions to create fun things bubbling colored water and worms. Girls Can! Box – I love monthly boxes (more on that in my post – “My Go-To Christmas Gift“). Each monthly Girls Can! box has an activity book featuring a inspirational woman’s story, games, experiments, and more, focused on encouraging young girls with an interest in STEM (science, technology, engineering and math. President & Vice President Barbie Dolls – The fact that this exists makes me so. freaking. happy. The dolls are available in three different pairs, including different racial representation and two of Barbie’s new body models. What an awesome way to encourage girls into leadership positions and get them envisioning such things at a young age. Today is Day 6 of my “12 Days of Giveaways”! Since so many of the gifts to inspire young girls are from Amazon, today I wanted to give one reader an Amazon gift card. Good luck! "Gift Guide: Gifts for Travel Lovers"
"New Year’s Eve Dress Idea (& Day 7 of 12 Days of Giveaways)"
This is such a cute gift guide. My daughter would love the big bag of science! Thank you Cathy. And aw, that is awesome! I love that she’s into science! 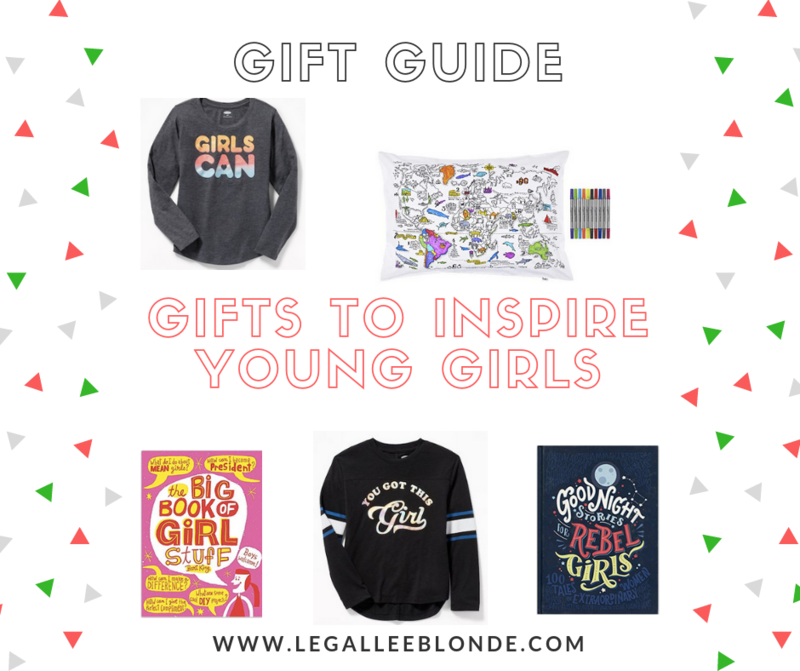 This is a helpful gift guide because I never know what to give to young girl. I’m so out of touch with what they are into these days! Aw thanks Rach, I’m so glad you found it helpful!! Oh, I love all of these different gifts! It’s really great to get different gifts. These are all really awesome gifts that I could find myself giving to all my friends and family. Such a great idea! I absolutely love everything you picked out. Aw this is such a cute gift guide!! Need to get a few of these for my daughter! Thanks Kileen! And aww yes, you should definitely get some of these for Kennedy! Aw I love these ideas! It’s so important to inspire girls from a young age! Thanks Liz! And I totally agree! OK major high five to all these gift ideas!! I love the thought process behind this — preteen girls especially need lots of inspiration and subtle empowerment. Totally sending this to a couple of girlfriends of mine with kids in the right age range. how cool! my daughter would love that pillow art thing! thanks for sharing! That’s awesome that she would love the pillow; such a fun creative gift! and Thank YOU for reading! I appreciate it! Aw I absolutely love the theme of this gift guide! Isn’t that a cool one?! I know next to nothing about technology, so I love the idea of inspiring young girls to explore it and learn more.